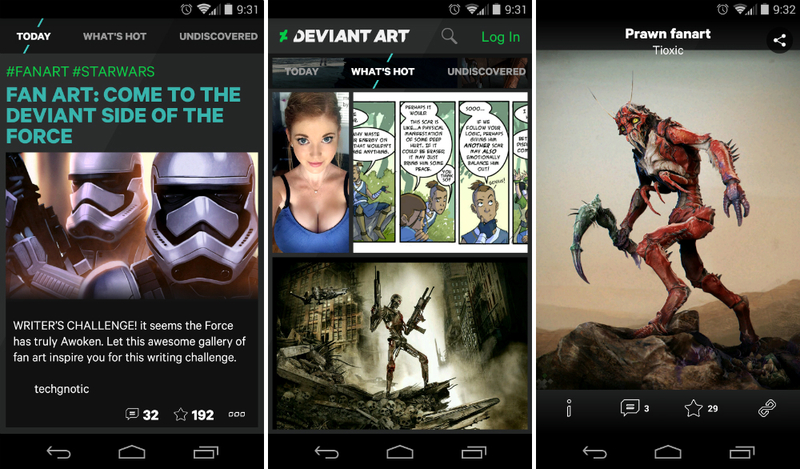 DeviantArt, undoubtedly the world’s largest online indie art gallery, now fits entirely in your pocket. Forever, there has been unofficial DeviantArt apps on Google Play, but finally, there is an official build for art browsers and artists alike. New to DeviantArt? Well, if you enjoy Star Wars, photography, digital art, awesome wallpapers, half-naked females (and males), then DeviantArt is the place to be. Using the site’s search bar, you can literally find art for any subject you can come up with. It’s easy to get lost, but if you have never tried it, give it a shot here. As for the app, think of the entire site, but in app form. You can still search, browse “what’s hot,” new trends, and much more. Each piece is viewable, sharable, and savable. Now go and look at some cool art.